But most young people still want to film concerts, so they can watch them back later. More than a quarter of gig-goers under 30 years old think mobile phones should be banned at concerts because filming and photography is distracting and takes away from the experience, according to a survey by ticketing company Skiddle. The firm consulted 1,200 people aged 16-30 and found of the 27% of people who wanted the devices banned, 20% said it was because they block your view of the band. 37% said they were distracting and 34% said they take away from the experience. 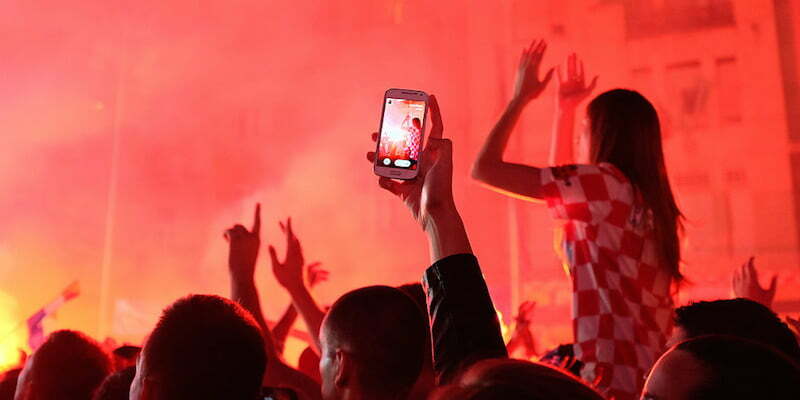 Of the 74% who said mobile phones shouldn’t be banned, over half (52%) said they capture footage because they like to relive the experience once they have left the event. Nearly a quarter (24%) said they like to share the music experience on social media and 13% said if they have bought a ticket it is ‘”their right to use their phones as they wish”. Commenting on the results, Skiddle director Ben Sebborn said: “The issue of banning mobile phones at gigs is one that has been hotly debated in recent months. We found the results of this survey particularly interesting because of the age of respondents. Typically banning filming and photography is an opinion most commonly associated with older generations – however this survey shows that many younger people agree that live music experiences are best enjoyed without handheld technology present. “However, despite the issue been highlighted by artists, gig-goers and venues on an almost weekly basis, it does appear that an overwhelming majority (74%) think that filming and photography should be allowed at live music events, which shows any crackdown will result in a high proportion of unsatisfied music fans.